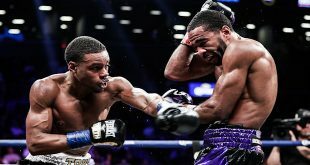 Boxing historians can now add this past Friday’s bout between USBA Jr. Middleweight champion, Derek “Pooh” Ennis and Jose Gonzalez to list of classic biuts that have taken place at The Legendary Blue Horizon as they engaged in a ten round war that was won by Ennis via majority decision. Ennis and Gonzalez waged a classic toe to toe war which had the near capacity crowd on the edge of their seats throughout the ten round classic. Ennis showed amazing hand speed as he ripped up six and seven punch combination’s that rocked Gonzalez all over the ring. Gonzalez stunned Ennis in round two for which Ennis seemed like he was in big trouble as Gonzalez continuously landed hard shots to the head but Ennis showed a great chin and came back more furious then before. Ennis won by scores of 98-92; 98-92and 95-95 to raise his record to 21-2-1. He will now look to defend his USBA crown in June or July. 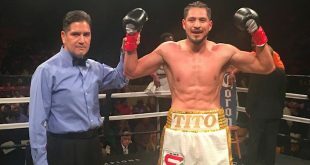 The co-feature saw Derek’s brother, Farah dominated and then scored a emphatic second round knockout over Frankie Santos in their scheduled eight round Jr. Middleweight bout. Ennis dropped Santos at the end of the round and Santos was not able to continue at the 3:10 of the second frame. Ennis remained undefeated at 13-0 while recording his seventh stoppage. 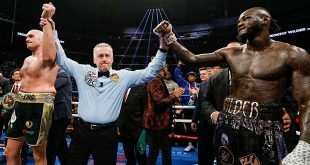 Heavyweight Bryant Jennings landed a perfect uppercut that laid out Jon Bolden for several minutes as Jennings scored a highlight reel third round knockout in a scheduled four round bout of undefeated heavyweights. Other winners on the card were Clemente Bethea, Jose Ortiz and Duane King.